A few weeks ago I made a 10″ magic fairy door and I used the block to make a 14″ pillowcase. The quilting process started having a mind of its own and I was happy to oblige. My original idea was to hand quilt everything. There was one problem – my stitches are still in the medium size range and the leaves looked horrible and clunky instead of small and delicate. I have done free motion quilting only once and that was probably a couple of years ago. So I took a deep breath, removed the little hand quilting I had done and started free motion quilting the vines and the leaves. As usual, my fear proved unjustified. Since I can adjust the speed of the pedal of my machine, it went rather smoothly. I am happy with the way the quilting turned out, even with the smattering of imperfections here and there. 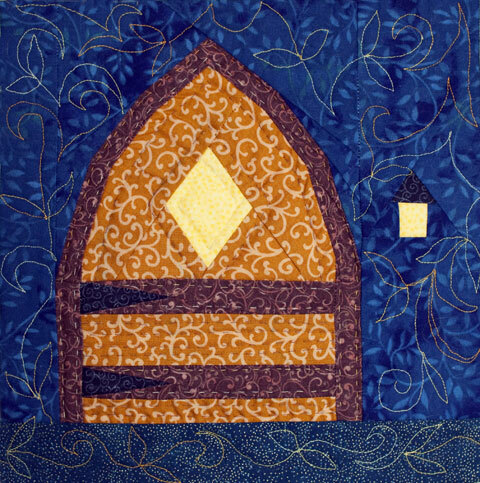 Once the machine quilting was done, I started hand quilting the door. 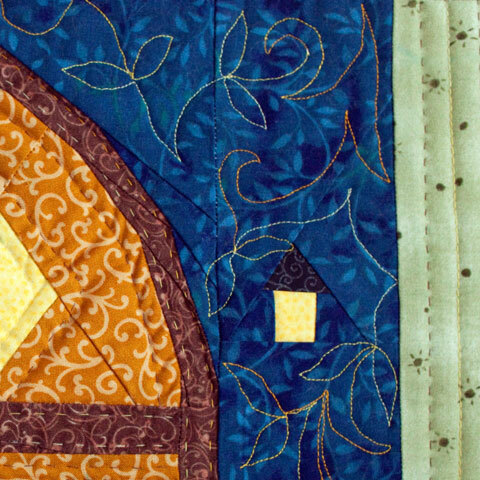 I think the hand quilting makes the door stand out from the surrounding vines and leaves. Toward the end, I started stitching along the border with my walking foot. 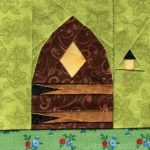 Then another idea came to my head – alternate the border with machine and hand quilting and alternate the thread colour as well. This is the first time I also decided to bind my pillowcase. It’s a woodland fairy door, so what else would I use but a brown binding to go with the light mossy green border. The finished pillow now resides in my husband’s room. Hopefully he will not be subject to naughty fairy shenanigans! Oh, the quilting turned out fabulous, Soma! 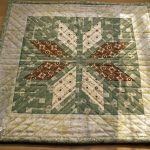 Love those viney leaves and the combination of hand and machine quilting. Great call! Looking good and look at your FMQ! Well done! 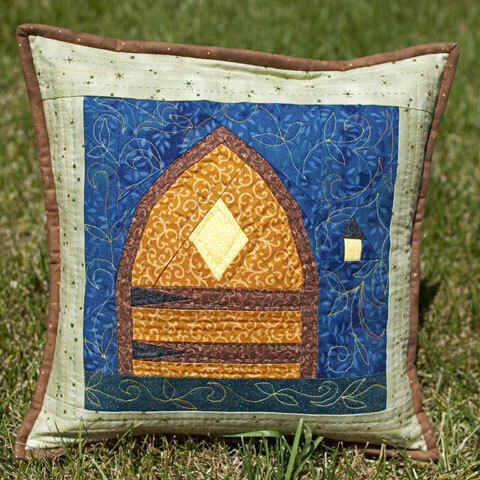 What a beautiful and whimsical pillow! I love how you used hand and machine stitching for the different textures! And what a fun way to brush up on some fmq skills! 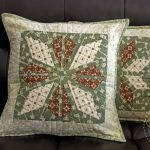 This is gorgeous, the vine quilting is so perfect for the theme! Love the binding on the pillow. I haven’t tried that yet, I must! The vine quilting is perfection. Nice finish! What a lovely pillow. I love your quilting and the binding looks fantastic. Beautiful pillow. I like the added texture that the quilting brings. The cushion looks wonderful, Soma :-) I like the idea of both hand and machine quilting! Really beautiful Soma. Very cool to have both the machine and hand quilting, but together they make the pillow so special. Looks great Soma!! I especially like the binding idea. I made a pillowcase for my daughter and put a binding on it and really liked the result. It just frames the pillow so nicely. This turned out wonderful. I love how you used varigated thread and changed up both machine and hand quilting. Well done. O my…this is your second time fmq? 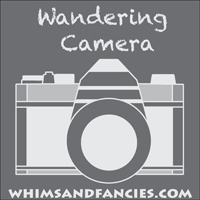 This is gorgeous, love the viney look…and everyone needs a bit of fairy shenanigans now and then, don’t they?